Sigh. Stupid economic apocalypse. I really wanted to get away for my birthday this year. Rough times on all fronts. Originally I had some fantasy about skipping town to Barcelona or Marseilles. But, no such luck. So, I settled for a staycation and escaped for the night to exotic Dupont Circle. The bed and breakfast that I discovered, however, turned out to be the best birthday idea I’d had in ages. The Artists Inn Residence, run by the incredibly kind Terry Gerace, is an amazing B&B at 18th and R Streets NW. 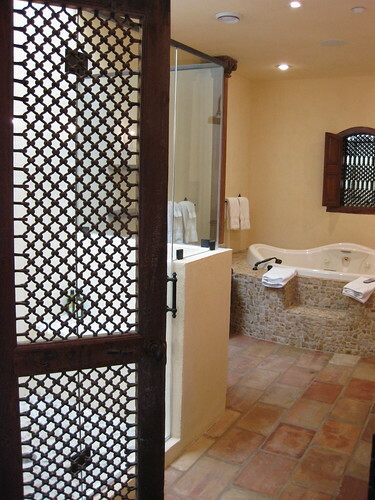 If you have any out-of-town guests to house or are looking for a romantic or peaceful escape, this is the place. Beautifully renovated, it’s filled with light and gives the impression of a gracious Parisian mansion with a modern twist. Six suites are lovingly decorated like perfect jewelboxes – each with a different theme that is never heavy-handed. The rooms are also completely outfitted with the technophile essentials like high-speed wireless internet, crazily hidden HDTVs, heated floors, mood lighting… I easily spent half-an-hour just fiddling with the gadgets like the TV hidden in the mirror over the massive stone fireplace. 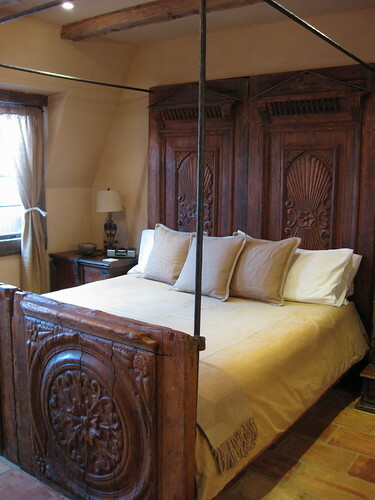 I stayed in the Da Vinci suite, with its bed constructed out of massive carved doors making me feel like I was nestled in a Tuscan farmhouse. Upon arrival I was even sweetly greeted by a little chocolate cake. Now that’s a class act. But oh, the bathroom! Total spa heaven in a whirlpool bath that nurtured my mermaid soul for a blissful hour before I went to bed. 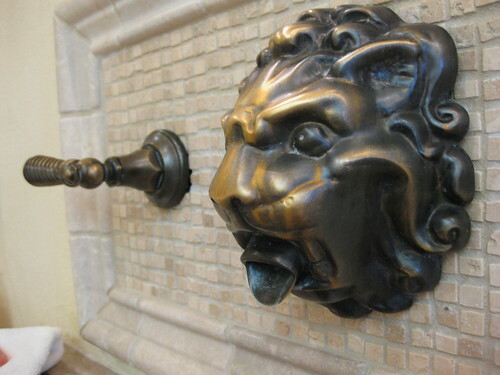 And nothing beats washing up with water poured from a lion’s head faucet! Except perhaps my morning shower under a rain forest shower-head, feet massaged by river rocks, bathed in sun from the skylight above – well, it was hard to leave. After a relaxing evening with the most restful night’s sleep I’d had in months, I awoke to find that it had snowed during the night, and enjoyed the cold pristine view from the breakfast room, feeling a bit like Marie Antoinette in the Petit Trianon. There was even a lovely gallery on the first floor with rotating art exhibits to peruse before I headed off to the office and real life, rejuvenated and grateful to be able to still enjoy life’s bits of beauty.